Storing clean or dirty cloth diapers has never been easier. For the clean diapers, we use Ke’alohi’s top drawer to hold all the diapers. We pre-stuff them with the inserts and also have the Bummis Bio-Soft liner already in them so that when we need to change Ke’alohi, it’s as fast and as simple as if we were using disposable diapers. 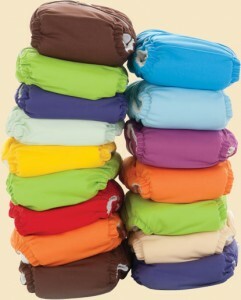 When we are on the go out of the house I usually keep two (more if it is a longer trip) diapers in my diaper bag. When the the diapers are dirty, we use a “wet bag” to hold the diapers until we do laundry. 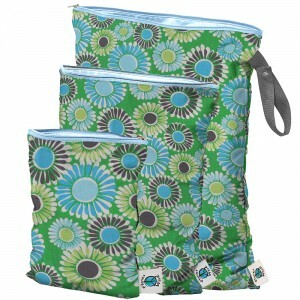 My absolute favorite wet bags are the Planet Wise Diaper Wet Bags. They have a cute fabric on the outside and are lined with PUL waterproof fabric on the inside. This two layer system not only keep anything from coming out, they are practically stink-proof. I have never smelt a dirty diaper that was in the bag since we started cloth diapering. Once you are ready to wash the diapers, all you have to do is throw the bag in the wash along with the diapers and it comes out clean and smell-free! Right now we have two medium size bags and that is fine but we will definitely be buying at least one more so that we can have one being cleaned, one being used and one ready to go or in the diaper bag. I like the planet wise bags as well. Cloth diapering is a lot easier than I thought it would be. I love those diaper colors! Ke’alohi always looks soooo stylish!